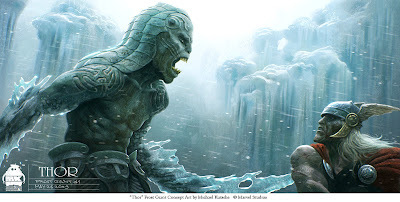 Early Frost Giant concept art for "Thor", directed by Kenneth Branagh. The image shows what kind of scale for the giants I originally had in mind. The Thor costume in this piece is based on the Esad Ribic version. Sooooo much better as what was in the final film. Texas got huge problems with jONES and SCHAR..VIRGINIA gave them BOTH to FBI. Great stuff, I love the frost king... Do you use mostly photoshop or painter? DISEESE - SCOMPO- COPORK- FOCK WORMS-COUTE. This is truely a great way to make consistent extra income. I've done the scouting a family friend who buys properties to rent and while I thought I had done a good job for him, he showed me that there is a lot more to look at then just the property. Location is always important: access to major highways, local business's, schools etc. Take a look at your area as well as the property before jumping in with both feet. Great article. Nice picture. The giant looks scary.